Dolores Huerta and Medea Benjamin at the DNC Women's Caucus meeting, 2012. 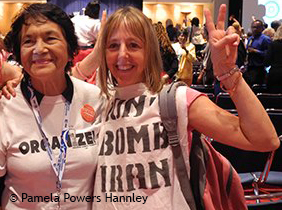 Dolores Huerta and Medea Benjamin at the DNC Women’s Caucus meeting, 2012. On route to a women’s conference in Gaza, Code Pink founder and peace activist Medea Benjamin was detained by Egyptian police and held in an airport prison cell for several hours without being charged. During her detention, the petite Benjamin said she was “jumped on” by Egyptian police and “violently handcuffed” resulting in a fractured my arm, dislocated my shoulder, torn ligaments. Benjamin: … When I gave in my passport, I was taken aside, brought into a separate room, where I was held for seven hours without anybody ever telling me what was wrong. Then I was put into a jail cell in the airport, held overnight. And in the morning, five very scary-looking men came in and wanted to take me away. And I said, “The embassy is coming. The embassy is coming.” They were supposed to have arrived. Instead, they dragged me out, tackled me to the ground, jumped on me, handcuffed my wrists so tight that they started bleeding, and then dislocated my shoulder, and then kept me like that, grabbing my arm. The whole way, I was shouting through the airport, screaming in pain. Then the—I demanded to get medical attention. The Egyptian doctors came and said, “This woman cannot travel. She’s in too much pain. She needs to go to the hospital.” The Egyptian security refused to take me to a hospital and threw me on the plane. Thank God there was an orthopedic surgeon on the plane who gave me another shot and put the arm back in its shoulder. But they were so brutal, and, as I said, Amy, never saying why. Egypt has deported Benjamin to Turkey, where she is seeking medical treatment. Check out the full story on Democracy Now… here.